As Green Team members, Buffalo high school students develop job and leadership skills through a variety of community-based conservation projects and hands-on learning experiences. 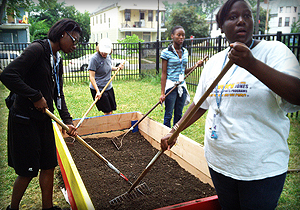 The Green Team provides students with the opportunity to improve the environment within their own neighborhoods as well as take part in service work opportunities in National Parks around the country – cultivating citizenship, environmental leadership and an understanding of the relationship between the city and nature. In 2012, Groundwork Buffalo joined the Green Team USA Partnership in the Northeast Region (NER). 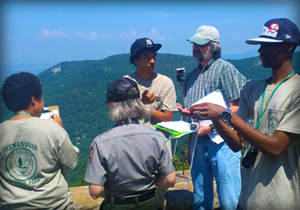 Students traveled to Shenandoah National Park where they spent five days exploring, learning, and working with National Park Service rangers. 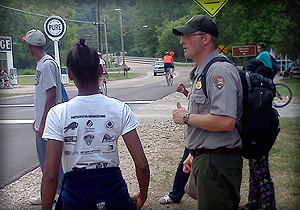 Groundwork Buffalo launched the Summer 2011 program with a trip to Cuyahoga Valley National Park. Green Team members learned how to control Autumn Olive, an invasive exotic plant that is undermining the ecological health of the park. The team learned about the Erie Canalway National Heritage Corridor, which runs through Buffalo. In addition to their National Park experience, the Green Team established a learning garden at the African American Cultural Center including the installation of two raised beds for growing vegetables, and began a landscape makeover for the Friends to the Elderly Senior Center. The Green Team also began work on Pelion Community Garden, which is a Groundwork Buffalo and City Honors School partner project.